The James Proclaims Advent Calendar of Christmas(ish) Films – Door 22 – James Proclaims! Door 22 of The James Proclaims Advent Calendar Of Christmas(ish) Films and we’re almost at the end. By which I mean the end of the Advent Calendar, not the ‘End of Days’. But today’s film does have an apocalyptic feel to it nonetheless. For it is none other than Terry Gilliam’s 1995 noirish, sci-fi, time-travel flick 12 Monkeys. Starring Bruce Willis as James Cole, a convict from a post-apocalyptic future (2035) who is sent back in time (to the nineties) to gather information for humanity’s future salvation. Or is he James Cole, a man with mental health problems actually from the nineties who has, through his illness, constructed a post-apocalyptic fantasy? There’s certainly some ambiguity at the beginning of the movie, not least because the scenes set in the nineties are played with relative sincerity, whereas the future feels a bit more…er…Gilliamesque. Kathryn Railly (Madeleine Stowe) is the psychiatrist who tries to help Cole regain his sanity only to find herself questioning just how mad he really is. 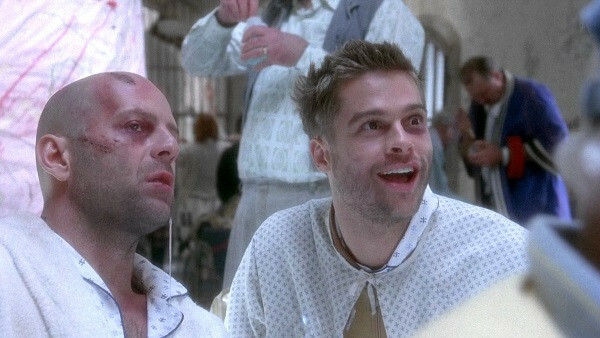 There’s no questioning the sanity of fellow psychiatric patient Jeffrey Goines (Brad Pitt) though. He’s properly mad. Pitt delivers a performance that is completely unhinged and rightfully earned himself a Golden Globe (and Oscar nomination) for his efforts. 12 Monkeys is an intriguing examination of the notions of reality and memory. It’s also an exploration of the concept of fate and the predetermination of events. Although I missed most of that when the movie came out because I was a stupid teenager who required nothing more from cinema than mindless action. And, to be fair, the film works pretty well on that level too. In truth, not much of the film is actually set at Christmas time, but the pivotal event that leads to humanity’s doom does take place during late December. In an early scene set in the future we see Cole in an abandoned dilapidated department store, with some sorry looking Christmas decorations that have clearly seen better days. Towards the denouement of the movie we see the same store, pre-apocalypse, and full of festive cheer. In truth, it’s not the most Christmassy of films, but there’s enough Christmasishness towards the end of the movie, particularly when juxtaposed with the opening scenes, to make the forthcoming tragedy seem all the more poignant.